Today’s union commercial carpenter is the product of comprehensive, unmatched training. Attention to safety and health is stressed constantly, because of the machinery, tools, materials and equipment used in this trade. Our training will teach you to measure, saw, level and in general work with a host of building materials. Your training will focus on becoming proficient with the tools and strategies and cognitive skills needed to build everything from schools, churches and hotels to skyscrapers, hospitals, office buildings and prisons. Your training will enable you to help construct bridges, tunnels and highways. A college graduate with a bachelor’s in business degree, Darlene spent over 10 years in health care administration. Finding her position less-than-fulfilling, Darlene enrolled in the Hard Hatted Women’s pre-apprenticeship program. 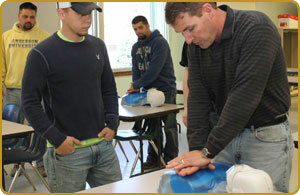 “The apprenticeship program is helping me to become a well-rounded carpenter. The more you know, the more opportunities you have in the field of carpentry. 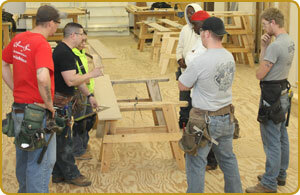 I believe that the union’s carpenters’ apprenticeship program offers the best training and the best benefits. It’s a great field to be in where there are plenty of jobs for good workers.